5 Things I wish I had known before coming to Leiden! If you already have found housing then you can skip directly to tip # 2 – if not then, first thing is first, do not panic. I’ve included some useful tips that could solve your housing sitch. I know housing is a pain (I’ve experienced this myself) however, for February starters there’s still some time. Below are some Facebook groups you should join to try and find a room or a studio/apartment via social media. Join these ASAP and start by both posting and turning on notifications for these groups. Comment on a person’s post – if it is of interest to you – with a simple “PM 🙂 ” that way they will know to find you in their inbox. If you still cannot find a place in Leiden – ever consider living in The Hague? I lived there my first three months at Leiden University and I honestly enjoyed every moment of it. So you can easily expand your horizons into neighbouring cities. The Hague is a short 10 minute train ride away and it takes you directly to Leiden Centraal, with trains leaving from both Den Haag Hollands Spoor (HS) or Den Haag Centraal. The University is then a couple of minutes walking depending on your faculty. Pretty picture of the Hague I captured. And the train card…this leads me onto my next tip. One thing I wish I would have known before I came to the Netherlands, especially whiIe was living in The Hague was to apply for a Personal OV Chipkaart. You can purchase a personal chipkaart online, click on this link: https://www.ns.nl/en/season-tickets/dal-voordeel.html and it will take you to the Netherlands Spoorwegen (NS) site, giving you 40% discounts. Buying this may be somewhat complicated, but don’t worry my 3rd tip will help. Also because it has an English language App. Last but not least, Leiden is super cosy and there are always house warming/parties/gatherings, so after all this you can finally relax with your girl (or guy) friends. The picture below is when a friend of mine finally moved into her new place (she definitely went through all these steps before we got here) and she had a small gathering! Remember the Kringloop winkels, where you can buy good second-hand clothes, furniture and kitchen equipment at very low prices – and help people with learning difficulties at the same time! You can also have a simple meal there at a very good price. The ‘Warenhuis’ is sponsored by the municipality. Close by the Warenhuis, in the Admiraal Bankertlaan, is the Boekenzolder, where you can take away ten books a day, completely free. Books in many languages, not only European but Korean, Japanese, Arabic, Hindi and many others. See the websites for more information. Hi, how are you Janet? Hi, how are you Mariela? Hi! I’m an international student from Indonesia. This post is very helpful! Super! 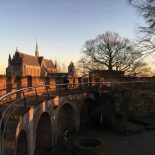 This entry was posted on December 6, 2017 by Aisha Isse in Living in Holland, Practical Stuff, Student Life, Uncategorized.